If my images are too large, please let me know. I would be willing to make an exception of max 500x250 for your dual screen shots. (*) i have at times disputed that, because what really matters here is the file size, not the image dimensions. what are those thin lines at the bottom? They aren't too much larger than a standard scrot. Will resize though. I agree it should be files size rather than image size. Anyway, those thin bars are my polybars. In the centre of each screen it shows the workspaces. The left hand screen has a green indicator to show updates and on the far right is volume. Got rid of NetworkManager, using way too much ram. Trying to figure out tmux, have a vague idea and used some plugins. Im using suckless st in tmux here, patched to use .Xresources and patched with alpha for transparency. Without tmux st is not very nice. Patched in a systray for dwm and seems to work well. Changed the conky a bit. What are you using for the system information in the dwm bar? Its just a modified version of the one archlinux has on the dwm wiki page. So that is a conky with icons. 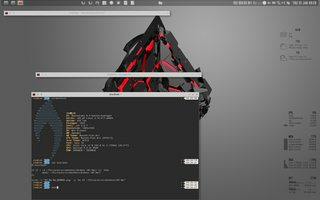 You should post the conkyrc in the main conky thread if you haven't already. Make a handy reference. ^ conky with font awesome unicode glyphs. I did share the conky configs, updated that post below. Figured out the compton.conf settings since then too. They aren't too much larger than a standard scrot. even a standard scrot is way too large to post directly. which is what you did. the idea is to have a 250px thumbnail that is also a link to the full-sized image, so that the forum page does not load the full-sized image. i see. very minimalistic, yet informative. nice. That chip looks like it has a xbox logo on it? Nice amalgam of colours though i like it. I noticed it, too. Does Xbox brand their processors, or was that part of the wall GIMPed? Is this even a photo that's been edited, or is it purely a digital artwork? Thanks regarding the polybars. (You too Bronto), I went back to a full panel recently but it felt overwhelming and felt far too busy. I could probably go 100% barless and be quite okay. Looks legit enough to be a console, probably is. I heard they use Ryzen chips? 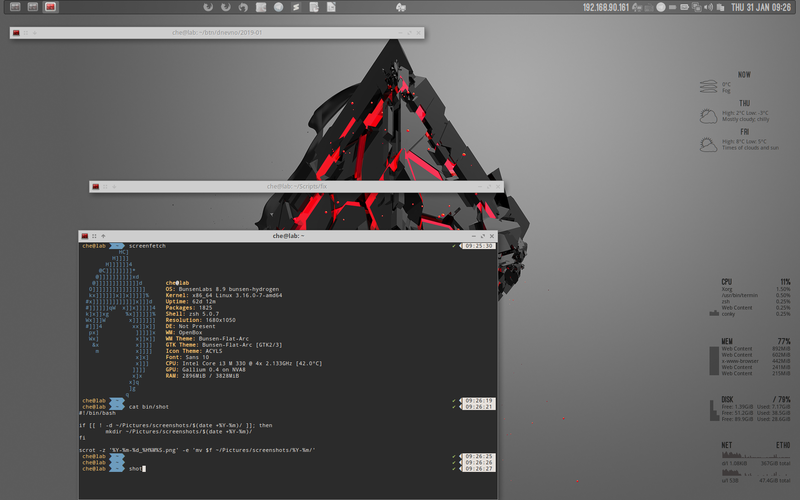 Still rocking the same look I've settled with a long time ago with some minor tint2 tweaks and different weather conky. Unstickying this threadand creating one for February.